Wan t a nice, quick memory game for your child that will help them improve memory and thinking skills? 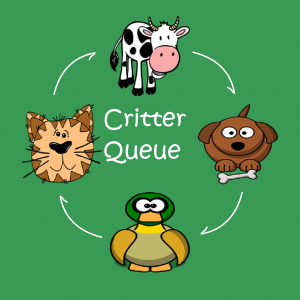 Critter Queue is a fun memory game for kids that starts off like the old Simon game of years past. The easy level is a fun, engaging remake of that game. The tiles are critter icons with their respective sounds. For a greater challenge, change the game to the Medium level. 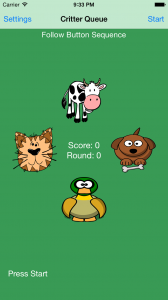 The critters randomly change positions adding confusion to the mix. However, follow the sequence and disregard the critter at any given time. The sound tones follow the critters, not the sequence, adding confusion and challenge. For a really challenging experience for your kids, change the game level to Hard. The critter positions are again randomly changing each and every sequence. Follow the critters and ignore the button sequence. Not only do you have to remember the critter sequence, you have to remember it while chasing the critters to whichever random position they may appear the next time.